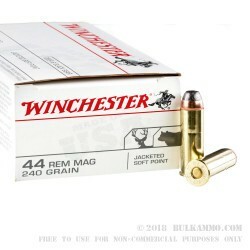 This .44 Rem Mag cartridge by Winchester sports a 240 grain jacketed soft point projectile. The bullet’s partial jacket facilitates in penetration, while its exposed core will mushroom outward to create a wide and devastating wound channel. 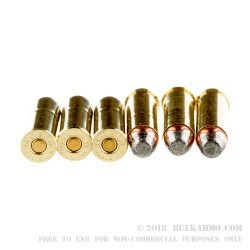 Because it provides performance similar to a hollow point’s without the actual cavity in its tip, this round’s bullet makes it ideal for use in areas where hollow point bullets are banned. This round’s blunted nose makes it ideal for use in rifles with tubular magazines as well, as it is far less disposed to strike the primer of the cartridge in front of it. 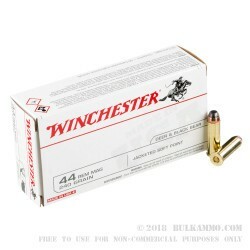 Winchester boasts that this round’s consistent accuracy and high energy deposit make it perfect for hunting large game, and its supersonic 1,180 fps muzzle velocity certainly supports that claim. 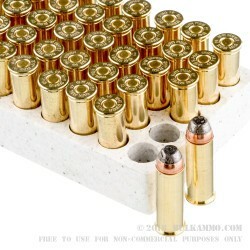 This round’s responsive primer, high quality reloadable brass casing, and clean burning propellant will all serve you well during your next hunt or target practice session.